Geoplast always guarantees the highest quality of materials and respect for the environment with our innovative products for biostabilization and biofiltration system. 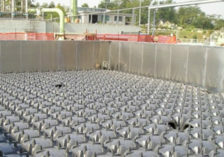 Biomodulo is the ideal solution to create perforated and self-supporting floorings for air diffusion in biostabilization systems that ensures a perfect bio filtration of the material to remove the unpleasant smells. 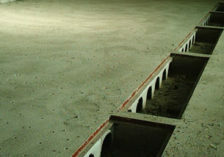 Created with Polypropylene (PP), a recyclable material which can be obtained also from the regeneration of plastic waste, it is strong, solid and provided with 4 nozzles designed with an ideal diameter to guarantee a uniform air diffusion all over the flooring, for an accurate filtration.